This article is a short summary of Super Mario Bros. 2. Super Mario Bros. 2 is a platformer video game released for the Nintendo Entertainment System in 1988 as the sequel to the original Super Mario Bros.. Because of the difficulty of the Super Mario Bros. 2 released in Japan and its graphical similarities to the original game, Nintendo instead altered the Famicom Disk System game Yume Kōjō: Doki Doki Panic and released it overseas as Super Mario Bros. 2. This game would later be released in Japan in 1992 as Super Mario USA. "Mario's back! Bigger and badder than ever before! This time it's a fierce action-packed battle to free the land of Subcon from the curse of the evil Wart. It's up to you, along with Mario, Luigi, Toad, and the Princess, to fight your way through bizarre multi-level worlds and find him! This time you've got a brand new kind of power—plucking power—and now anything you find can be a weapon. But beware! You've never seen creatures like these! Shyguys and Tweeters! Ninji and Beezos! And you've never had an adventure like this! Only cunning and speed can save you now..."
One night, Mario has a strange dream where he sees a long stairway leading up to a door. When he opens the door, he sees a completely different world and hears a faint voice telling him that the land was cursed by Wart. As soon as the voice pleads Mario to help, a bolt of lightning suddenly flashes and causes Mario to wake up. He tells Luigi, Toad, and Princess Toadstool about his dream and they decide to go a nearby mountain for a picnic. While looking at the scenery they notice a small cave nearby and enter it. They see a long stairway strikingly similar to the one Mario saw in his dream and climb it. When the open the door at the top of the stairway, they see the same world that Mario had seen, much to their surprise. Due to Super Mario Bros. 2 being a redesign of Yume Kōjō: Doki Doki Panic, it has many elements not present in the original Super Mario Bros., such as the ability to pick up and throw enemies and objects and a life meter. However, it does have some power-ups similiar to the ones in the first game such as the mushrooms and the Starman. At the start of each level, the player chooses which character they want to play as. The playable characters are Mario, Luigi, Toad, and Princess Toadstool. They each have slightly different jumping power, with Luigi being able to jump the highest and Toad having the least jumping power. They also having varying speeds in picking up items, with Toad being the quickest and Princess Toadstool being the slowest. Unlike in the original, the player chooses their character at the start of every level, and can beat the game without needing to play as all four characters. There are seven worlds in Super Mario Bros. 2. The first six worlds each have three levels while the seventh world has two. At the end of most levels, the player has to fight Birdo and another boss at the end of each world. 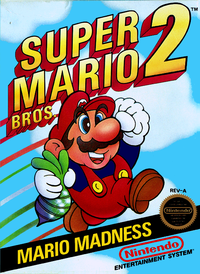 Super Mario Bros. 2 Arcade (Nintendo PlayChoice-10) 1988 A direct port of Super Mario Bros. 2 released for arcades. Super Mario USA Famicom 1992 A direct port of the game for the Famicom, titled Super Mario USA. Game Boy Advance 2001 A Game Boy Advance port of Super Mario Bros. 2, including Mario Bros. as an additional feature. 2008 (KOR) A direct port of the game, released as a digital download for Wii. Wii 2008 A direct port of the game is included as a Masterpiece, as a 90-second timed demo. 2014 (JPN) A direct port of the original game with added Virtual Console emulator features. Nintendo Entertainment System: NES Classic Edition 2016 Super Mario Bros. is one of the games pre-loaded onto the system. This page was last edited on 12 February 2017, at 04:29.